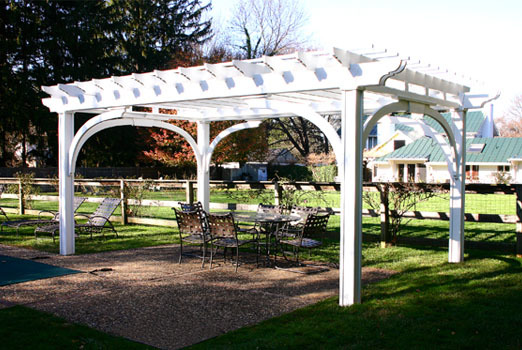 This client requested a pergola, stained white, that would provide significant amounts of shade. In order to keep the structure light in appearance, we incorporated a very nice white shade cloth that provided a 60% UV filter. 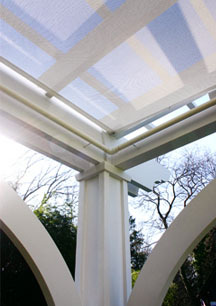 The shade cloth is attached using stainless steel clips and is put up in approximately five minutes. The arches are functional in stabilizing the structure and are aesthetically pleasing. The arch and bracket are perfectly symmetrical about the post. We used 7½" x 7½" posts as the structure was quite large at 18' x 11½' post to post. At the client's request, we incorporated a rod from which will hang side curtains to be installed at a later date. 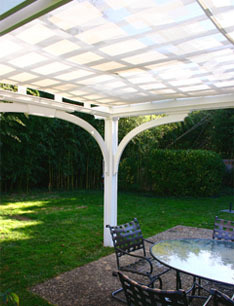 The rod runs the entire perimeter and allows the curtains to be moved unimpeded by supports.